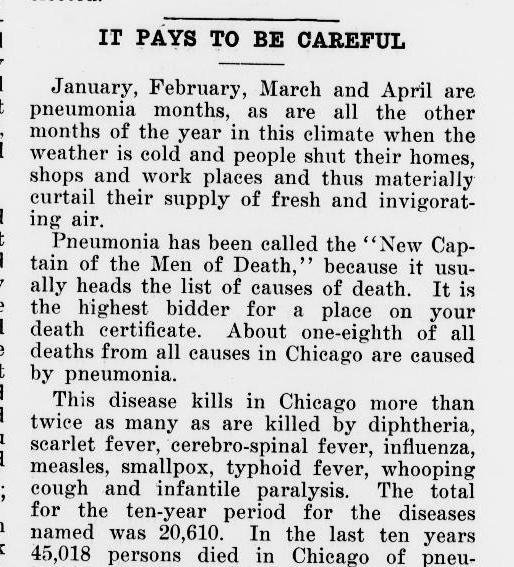 Over 45,000 deaths from pneumonia have been reported in Chicago over the prior 10 years, making it the "New Captain of the Men of Death," or the leading cause of death. January to April is the leading time, as a result of the curtailed supply of fresh air. Seattle's African American newspaper newspaper describes the segregated conditions at Camp Lewis, where blacks are assigned to menial duties while whites relax, the article concludes that is the report is true "the dirty skunk issuing the order ought to be sent to military prison for life." Source: "It Pays to be Careful," Cayton's Weekly, Seattle, Washington, February 23, 1918. Page 2, Column 3.